Bryce Canyon’s hoodoos, arches, and red rocks make it an amazing park for hiking, but it flies under most peoples’ radars. Take advantage of its quieter hiking trails and make this Utah wonderland your next outdoor adventure. They say more than 7,500 stars are visible in the skies above Bryce Canyon. When you compare that to the 2,000 you can normally see that already gives you 5,500 reasons to go to this National Park in Utah. This article will likely give you a few dozen more reasons to go, so follow along! 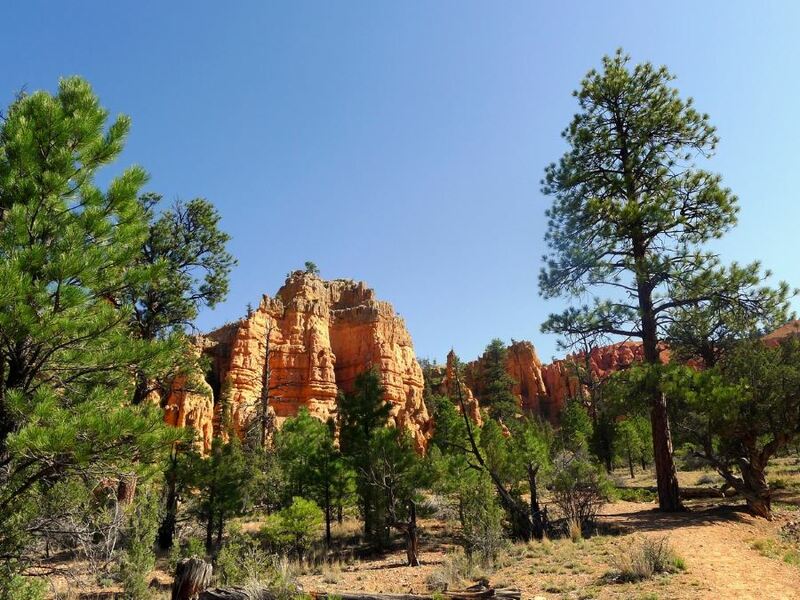 Bryce Canyon is visually unique with red earth contrasting against the green of fir trees. It will get snow in the winter too, beautifully contrasting the red and white. Also, it’s secretly not a Canyon but a series of big natural amphitheaters all along the eastern side of the Paunsaugunt Plateau. That plateau sits on the south-western side of Utah. 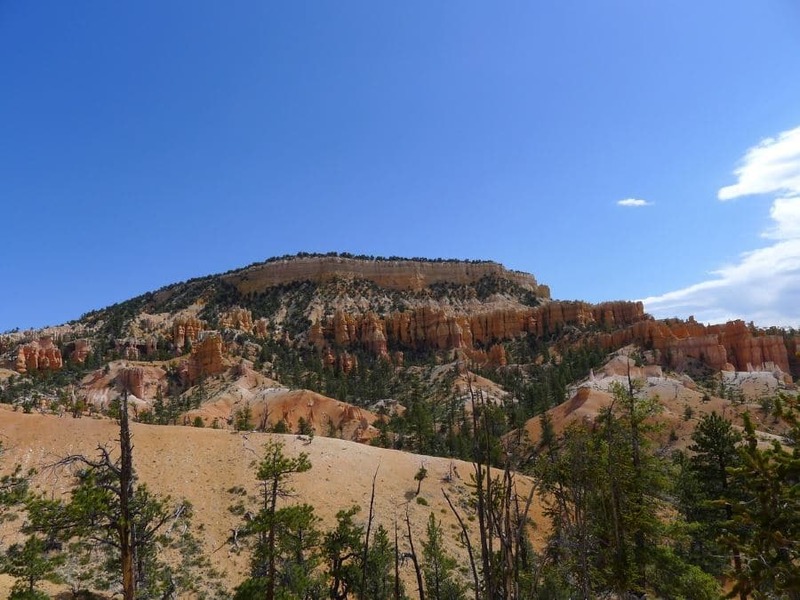 While visiting Bryce Canyon, there are lots of small towns to stay in, as well as good campgrounds around the park. The lodging and dining options inside the park are limited, but good. 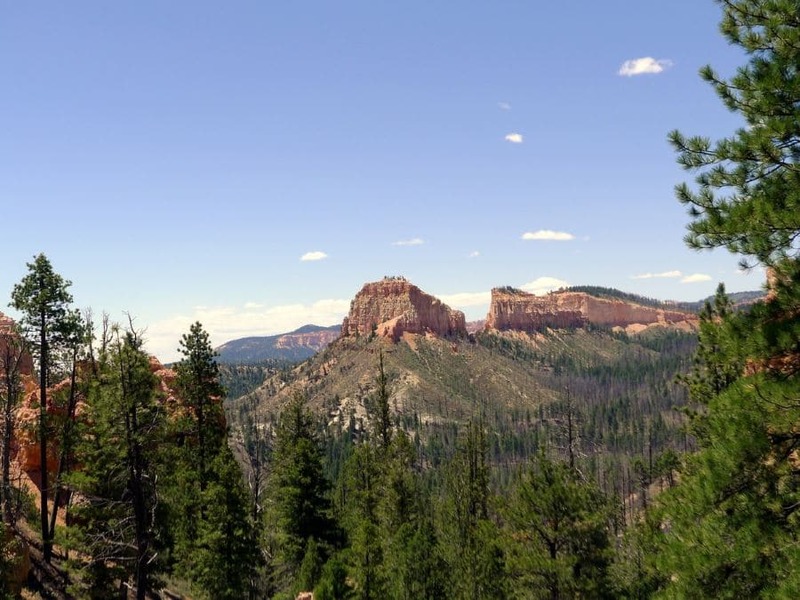 When deciding on a home base you can try and find something between Bryce Canyon and Zion National Park and “hit two birds with one stone” but that means extra driving. 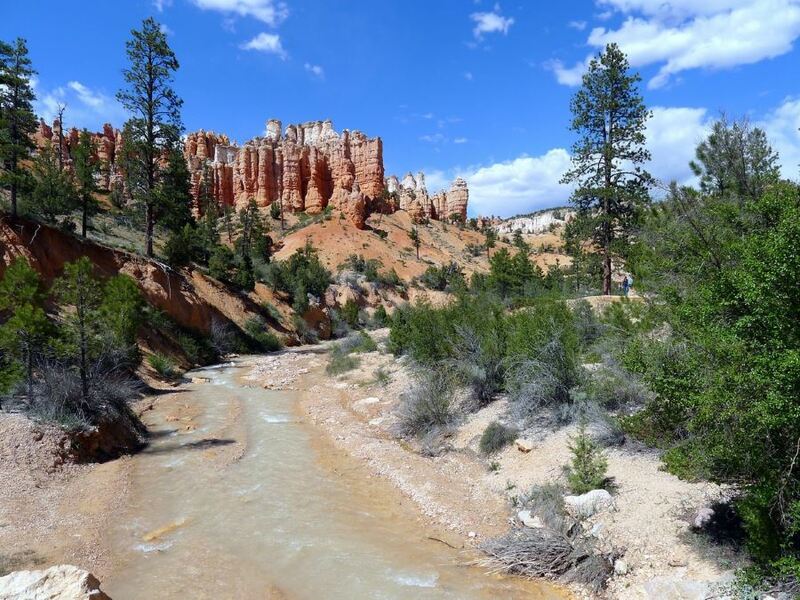 We recommend staying as close to Bryce Canyon as possible so you can spend more time in the park. Its beauty warrants its own trip. 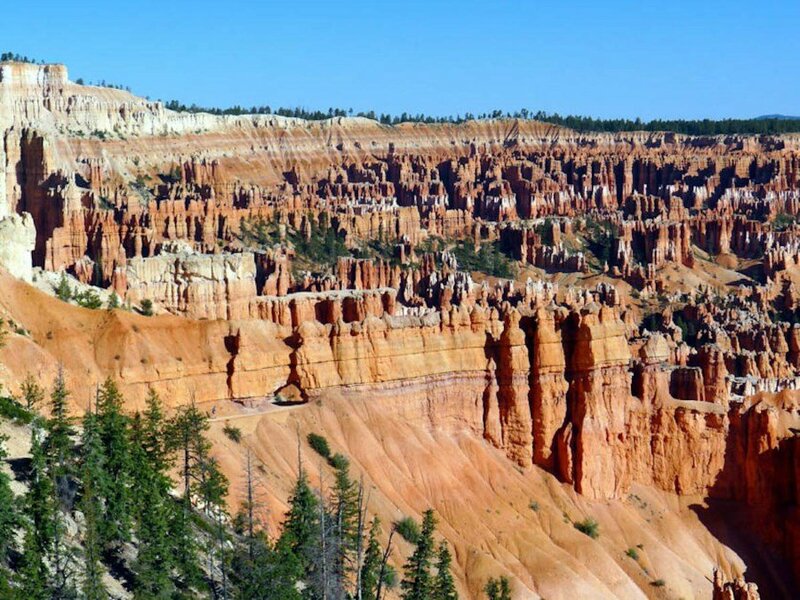 You’ll find some cities saying “they’re a great base for Bryce Canyon” but in reality they are an hour away. An hour drive in what could be extreme summer heat! We think Tropic is a great place to base your trip from, and we feature a number of places from Tropic in this guide. 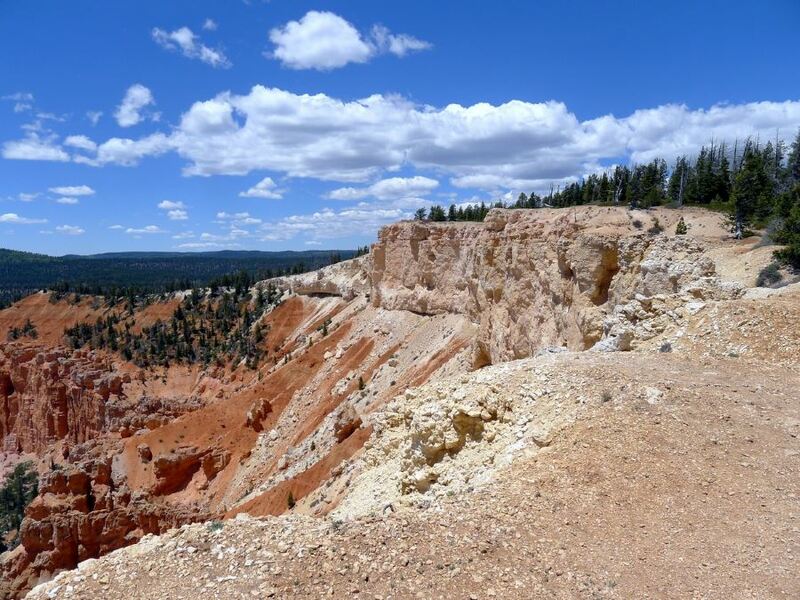 There is so much to explore in Bryce Canyon, which made picking only 10 hikes a real challenge. Our hikes take you past streams, arches, cliffs, and hoodoos (of course!). Bryce Canyon’s closet major airports are Las Vegas (LAS) and Salt Lake City (SLC) but “closest airport” is a bit of a stretch as they are both 270mi away. If you want less of a drive you can try Cedar City, Utah (CDC), which is only 80mi away but they only do service to SLC. You can try St. George, Utah (SGU), which is 125mi away. SGU has flights that mostly come in from SLC, Denver, and Phoenix. 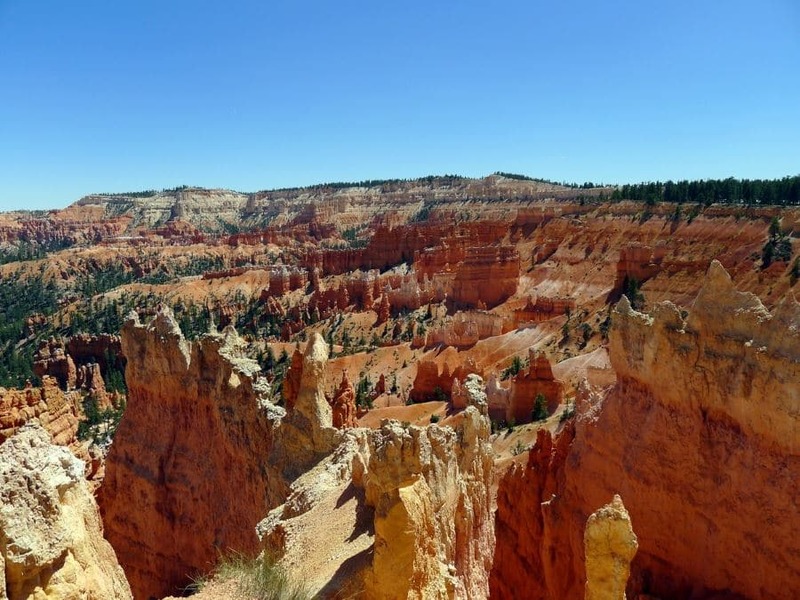 While it isn’t as popular as Zion National Park, Bryce Canyon does still get an estimated two million visitors a year, so you’ll want to pick the right season to go. 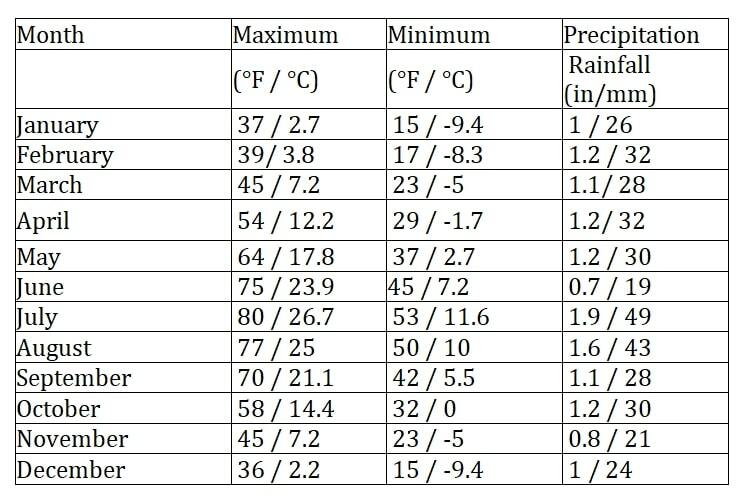 Given that it is a higher elevation (8,000 to 9,000 ft) than the other parks in Utah, the temperature is more temperate throughout the year. It is recommended if you’re more interested in horseback riding that you go in spring and fall because the trails will be quieter. This is true also if you just don’t like crowds. If you want to snowshoe then obviously you’ll want to go in winter; although it can snow at any time due to the elevation, but as you’ll see below if it snowed in the summer months it would likely melt the day of. With the airports being so far away, and the small towns so spread apart, there’s really no other option than bringing or renting a car. You’re going to need the ability to drive around otherwise you’ll be stuck in some small town your whole trip! If you can get to the park, or if you’re staying at Bryce Canyon Lodge (more info below) there is a Park Shuttle. The fee for the shuttle is covered in the $30 park entrance fee so, in that sense, you might as well use it! Outside of chain-motel and -hotels there are two main options in the cities around Bryce Canyon National Park: roadside motel, or B&B. There are some unique motels, like the Galaxy of Hatch biker motel with its Americana feel and pro-biker attitude. There are also some more basic motels for cheap. In our opinion the B&B options out-weigh the motels in these small towns. Inside the park there aren’t many hotels, but there is the fantastic Bryce Canyon Lodge. This lodge was built in 1925 and is now considered a National Historic Landmark. There is no TV in the rooms and cabins because this lodge is meant to be relaxing and serene. You can unplug and unwind inside the park. It’s the full hiking trip experience; however, if you want more surrounding amenities you can explore outward to the surrounding towns. In Tropic you have a number of options, but none of them are overly luxurious. For a B&B feel, we recommend two options, Bullberry Inn B&B and Bryce Canyon Livery B&B. Bullberry Inn is a little more affordable, but the rooms are a little sparser. Both have excellent breakfasts; Bullberry uses ingredients from their organic garden, while Bryce Canyon Livery has a little more of an inventive fare. With both places, you realize your paying in part for the excellent location. Tropic is only 11mi from the park. The hosts are very friendly and well loved at both places and the rooms are always clean and functional. These are a big step up from the roadside motels. Another unique Tropic option is the Bryce Canyon Log Cabins. The separate cabins are spacious and have everything you’d need in them. If you feel like living like a pioneer but still want modern amenities than this is a great choice! If you’re thinking the town of Hatch is a good match for your travel plans, look no further than Bear in the Bed and Breakfast. This is one of the best-reviewed B&B’s we’ve seen. It has cute log cabin feel with a “nothing fancy” attitude that makes for a down-home feeling that is special to this area. The last two options couldn’t be further from each other. On one hand there is a great resort, The Red Mountain Resort that has a special Bryce Canyon travel package that’s worth looking into. The resort is two hours away from the park, but when someone else is doing all the driving then maybe it’s worth it. This is the most luxurious option by a long shot and it also has a spa. Our last and most simple option is camp! 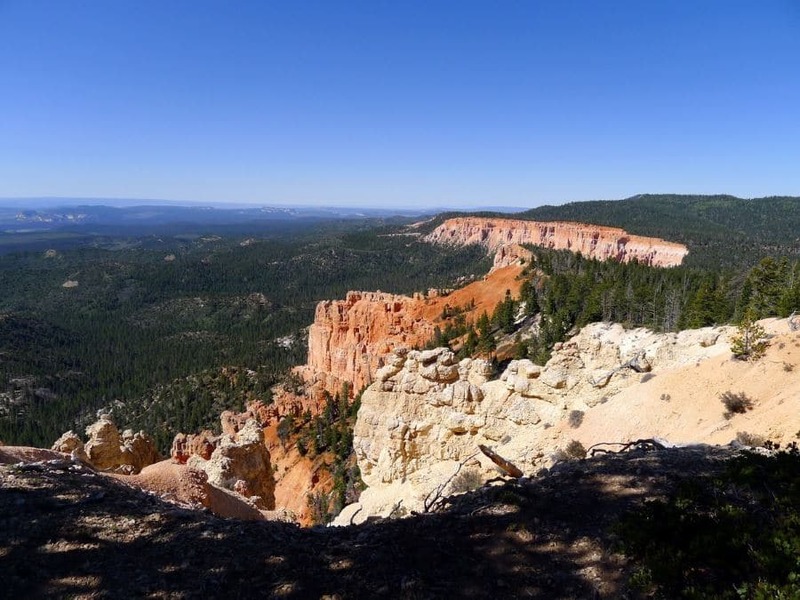 Bryce Canyon has lots of great Camping options, so we would strongly recommend considering this option. It’s early in the morning and you’re about to hit the trails. You want a latte, or an Americano, or espresso. There isn’t any place better than Bryce Canyon Coffee Co. There isn’t much competition for specialty coffees in the Bryce Canyon area, but their baked goods and hot drinks will hit the spot. Now you’ve been tearing up the trails all morning with the family, and you want something great, easy, and American for lunch. That’s when you’ll roll up to The Bryce Canyon Pines Restaurant. They have good home cooking and a menu to please everyone. Always highly voted among tourists and locals alike. Open from 7 a.m. – 8 p.m. everyday. With a day of hiking behind you, you want to treat yourself and your partner to a nice meal with exceptional views of the landscape you just conquered. Stone Hearth Grille is THE fine dining hot spot near Bryce Canyon. Great steaks and fish dishes are the specialties of Stone Hearth Grille, that and the views. Maybe on your night out you want to leave the rugrats back in the hotel? Well, good news is The Pizza Place at Bryce Canyon Inn is the best pizza in town! There isn’t a lot of unique out of box places to eat when in Bryce Canyon. Most places are going to have that home cooking or highway diner vibe and sometimes that stuff is honestly the perfect vacation food. No complaints here. WHAT ELSE CAN YOU DO BESIDES HIKING IN Bryce Canyon?  The other two best ways to enjoy the park itself would have to be on a horseback tour (The Canyon Trail Rides group is the ones to go to) and snowshoeing (go to the visitor centre and ask for Ranger Jim’s Snowshoe tours, rent snowshoes from Ruby’s Inn). But if reconnecting with the roots of the pioneers isn’t your cup of tea why not try one of the ATV tours offered at Ruby’s Inn: they go on for either a half or a full hour. Ruby’s Inn will also rent cross-country skis and mountain bikes and depending on the season there are plenty of trails for both options. For a great country music show check out Ebenezer’s Barn & Grill. It’s named after Ebenezer Bryce, the Mormon Pioneer who was the first westerner to settle in the Canyon. They have lot of live country shows and their menu has more of the “good home cookin’” you’ll have come to expect at this point. If you want to relax we can recommend The Red Mountain Resort’s spa, but keep in mind it is a two hour drive, so this option is likely only for those staying in or close to the resort. Most of the towns near Bryce Canyon do not offer such things. Because of the eroding nature of the landscape (hoodoos, etc. 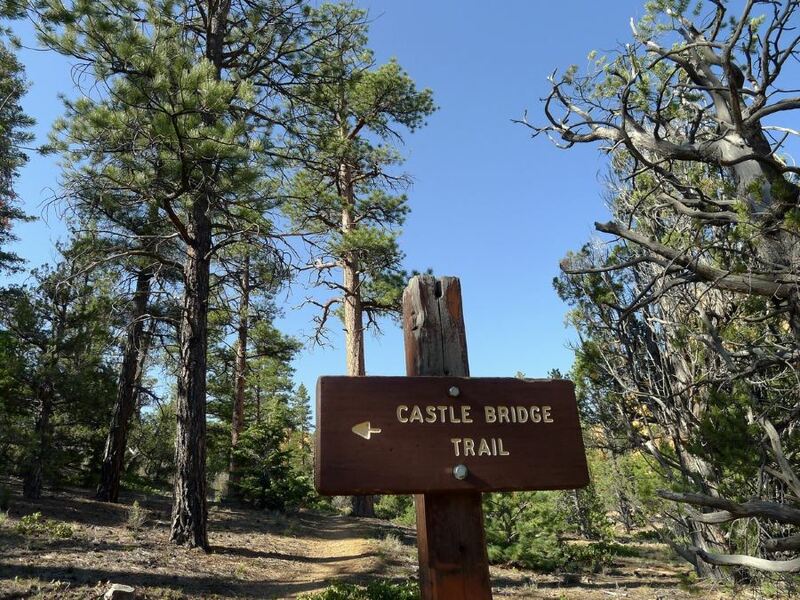 ), it’s extra important to stay on the marked trails in Bryce Canyon, and it’s twice as important in wintertime. LIGHTNING! Lightning storms are amazing to look at, but lightning storms can happen quickly and in Bryce Canyon are more dangerous than in other parts of the country. Get quickly back to cover if a storm starts taking place. Bryce Canyon’s number one safety concern is footwear. The ranger’s deal with more injuries resulting from bad footwear choices than all other dangers combined. This is why this is in the “Dangers” section. Bring some good hiking shoes! You’ll want to bring lots of water because there isn’t lots of shade on the trails. 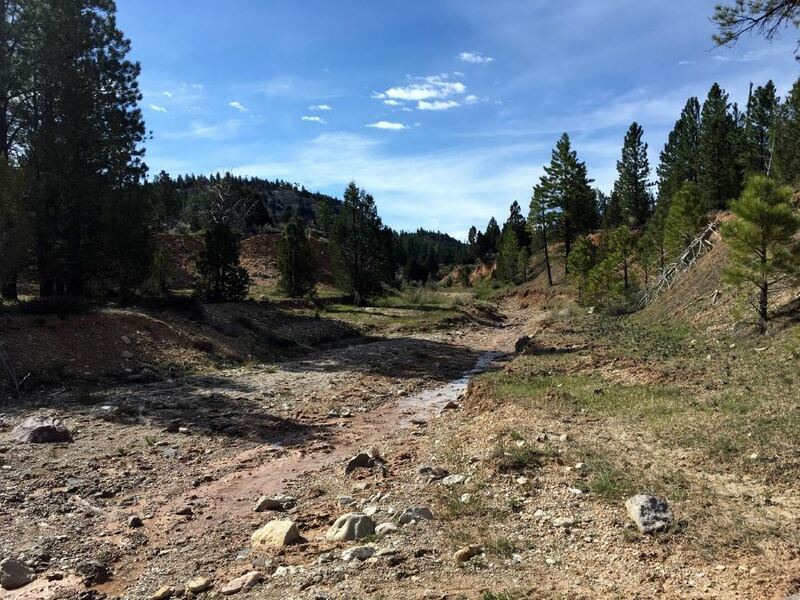 You’ll start some hikes from a high elevation (9,000+ ft) subjecting you to 70% your normal amount of oxygen, and since that is the start of your hike you’ll be coming back UP to that elevation to finish your hike. If you are feeling tired, turn around. Catch a Sunrise! It doesn’t get more beautiful than a Canyon Sunrise, get up early one day, get a coffee, and get to a nice vista.